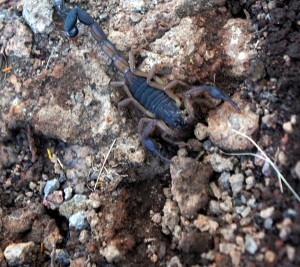 Home » Nicaragua » Volcanoes, Scorpions, and Bats! 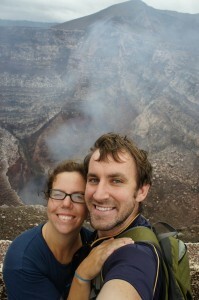 With the promise of lava and bats we were headed to Masaya Volcano. It was a short drive from Granada and we stopped on a market on the way. Little detours like this are inevitable on backpacker vacation packages. We get to see a market, the van drivers get a cut from anything we buy at the markets. Aside from a Jesus mask, the best thing at the market was the entry gate. As soon as we could smell the sulfur we knew we were at the volcano. We peered into the massive crater as fumes almost overtook us. The Nicaraguan’s call this volcano the “gateway to hell.” The guides had plenty of stores of ancient tribes sacrificing people into the volcano to stop it from erupting on their villages. In addition to the tribes throwing people in, the last dictatorship, the Somoza Regime, is rumored to have tossed a couple of non-conformers in there was well. Our guide’s father part of the revolution that engulfed Nicaragua in the 60’s and 70’s. After seeing the volcano, we went on an hour hike around the volcano to see a couple smaller craters. 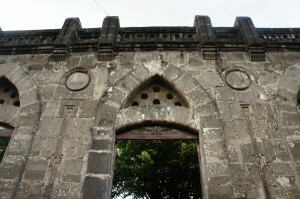 Within South America, Nicaragua is known for their great tasting pineapples. The Nicaraguan’s attribute the great taste to all the nutrient rich volcanic ash volcanoes have spread across the land. We saw some beautiful vegetation around the summit. 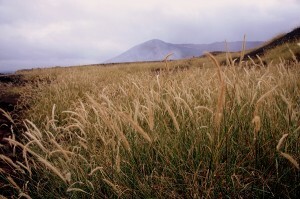 Fields of grass and shrubs sprung up after the last eruption demolished all the trees. As night started to fall we got on our helmets and started to walk to a cave. the cave had a couple bends and seemed to stretch forever. We needed flashlights to see our way through the dark, wet cave. Wherever we shined our lights, little bats were hanging. When the beam of light hit them, they’d start to crawl away and then bolt over our heads and out of the cave. All the ladies in the group would scream. Bats. Screams. Bats. Screams. It was like that for 15 minutes. During the revolution, mothers would bring their children into the caves to stay for months on end. The mothers did not want their children to be forced into fighting in the revolution or to be killed by the armies. Since the army did not know of the cave, the children were safe. With our flashlights off, the cave was pitch black. It made no difference eyes open or closed, just black. Moisture would drip off the ceiling, bats would scurry on the walls of the cave above us, and we could see nothing. I can’t image what that would be like for months on end. After seeing the inside of the cave we headed to another cave. But this time we only waited on the outside. This was the cave where all the bats stayed at night. Since we got their at dusk, the bats were all leaving for their nighttime feasting. 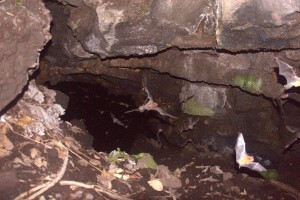 As we stood at the entrance of the cave, hundreds and hundreds of bats flew inches above our heads . You could literally feel the air from flapping wings as they brushed past us. It was intense. I got this picture of some bats flying out. After the bat cave we headed back to take one last look at Masaya Volcano. At night it was even more magnificent. We could see a glow from the lava deep in the crater. And when everyone was silent we could hear the deep roar of the volcano.